On December 5th, the OECD published its biennial flagship publication Pensions at a Glance. The 2017 edition again provides a trove of interesting data; here are a few highlights from this year’s survey (all figures below are from OECD Pensions at a Glance 2017). 1. In passing, the report offers a useful reminder just how modest average wages are in Canada. Whether measured at market exchange rates or purchasing power parity, the average wage in Canada is comparatively quite limited. Offsetting relatively strong earnings growth among high earners, a comparatively large group of workers continue to struggle with low wages. In 2015, 22.2% of workers in Canada toiled in low pay, defined by the OECD as earning less than 2/3 of median earnings. This placed Canada among OECD member states with the highest incidence of low pay. 2. Canada is no longer a top performer when it comes to reducing old-age poverty rates. Although Canada dramatically reduced overall poverty levels among seniors in the final quarter of the 20th century, the low-income measure among Canadian seniors has risen significantly since 1995. Today, Canada sits in the middle of the OECD pack with respect to old-age poverty rates. 3. Public spending on old-age benefits in Canada falls well below the OECD average, but the flip side is that Canada spends a comparatively large share of GDP on private pension arrangements, including via tax expenditures. 4. 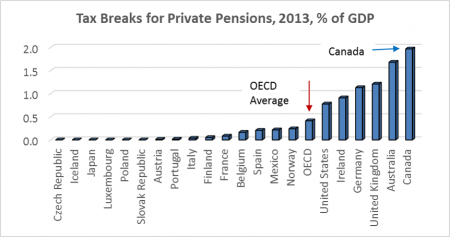 There are relatively few countries in the OECD that rely on voluntary private pension schemes, as Canada does. 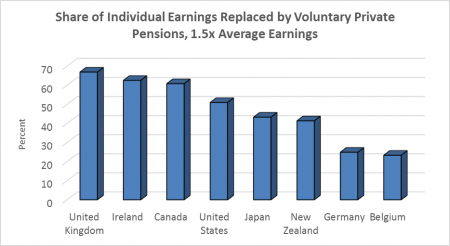 Among those that do, Canada stands out as relatively dependent on voluntary private pensions. 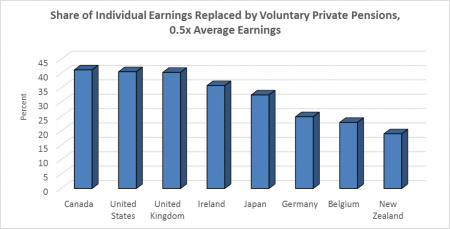 Low and high earners in Canada in particular draw a comparatively large share of their replacement income from voluntary private arrangements.